In a previous blog post, we focused on the Anatomy of a Good Lead – the characteristics of a lead that make it valuable to sales and marketing for additional nurturing and sales follow up. But how do we determine the value of these characteristics? With marketing automation advancements, lead scoring has become an essential piece to grading the readiness of your leads, ensuring proper hand-off at the right time to the Sales team. This blog post focuses on the importance of lead scoring to help you prioritize your best leads. Demographic score: Think of demographics as the fields one would fill out on a form like job title, number of employees, location and annual revenue. Behavior score: These scores quantify the actions a lead takes like clicking within a specific email, visiting a particular web page, viewing a demo and filling out a form. Total lead score: The combination of the demographic and behavioral scores. Demographics: Assign points based on how you collectively rank demographic information based on your ideal prospect profile. r instance, a form submission for a white paper download should receive more points than clicking on a link in an email. Also keep in mind that not all actions should necessarily be assigned a value (for example, opening an email). How do lead scores get tracked and assigned? A marketing automation system integrated with your sales CRM is the most effective way to get your lead scores tracked and assigned. Once the Marketing and Sales teams have mapped out the lead scoring model, you can build it in your marketing automation system. 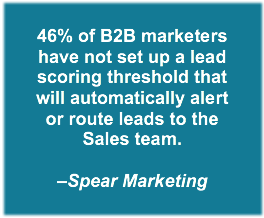 When the leads are deemed sales-ready, Sales needs to have visibility to them. This is why your marketing automation system needs to be integrated with your sales CRM. From there, with the help of your CRM administrator, you can set up custom fields to accommodate your model and lead assignment rules to send notifications to the appropriate rep at the appropriate time. With your lead score model in place, work together to determine how you want the lead to flow into your CRM. Ideally, new leads are only created in your CRM when it has reached the agreed-upon threshold. However, you may have a team of inside sales reps that may want to start working the lead sooner. Identify what actions trigger an alert to the sales rep. Keep in mind that sales reps are busy and cluttering their inbox with unnecessary alerts lowers their productivity. For leads that are deemed sales-ready, consider setting up automated emails that come from the rep. These one-to-one personalized emails will help drive further conversations and opportunities. Make sure to build this into your lead flow process. What are the benefits of lead scoring? The Sales team will appreciate getting good, quality leads at the right time. This helps drive their productivity and keeps them (and you) happy! 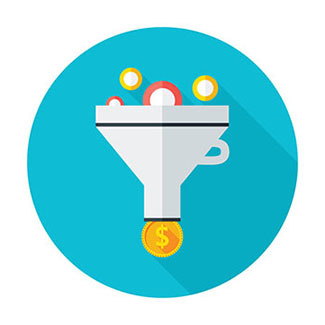 By understanding what campaigns and content your leads respond to, you can focus more efforts on the marketing activities that drive more conversions. The more effective Sales can be at focusing on the right leads, the more opportunity there is to close deals and contribute to the bottom line. Improve your Sales team’s conversion rates by focusing them on the leads that have the best opportunity of turning into real prospects. Contact GrowthMode Marketing today to learn how we can help you develop a lead score model that drives greater revenue for your organization.